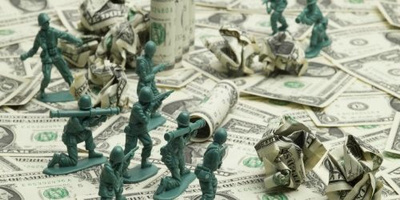 What could we accomplish if we stopped spending our money on war? Jay Syrmopoulos of The Free Thought Project recently brought to attention the fact that the money spent on war in 2015 could have bought each homeless person in America a $1 million house. We thought it would be interesting to see what else we could accomplish with the money that’s feeding the military-industrial-complex and have compiled a short list below. Let’s start off with Syrmopoulos’s findings. While it’s safe to say homeless individuals would not be provided “million-dollar” homes even if it were possible, the point to take away from this is that with the money spent on war, they theoretically could be. In January of 2015, the U.S. Department of Housing and Urban Development, or HUD, reported that there were 564,708 homeless people in the States on any given night. This means every one of those homeless citizens could have their own million-dollar house, and there would still be money left over. Due to lowered payment rates, recipients often have a hard time finding a doctor that will accept them, forcing many to rely on overcrowded ER’s and non-emergency care. Patients frequently receive inferior care, are assigned to surgeons with less skill, receive the poorest post-operative instructions, and more often than not, Medicaid patients suffer worse outcomes from procedures identical to those performed on patients with actual health insurance, or no insurance at all. Another major issue with medical care in America is that, like everything else, it’s become an industry whose first priority is in profits. Even with current costs, however, the money spent on war could ensure all Americans have access to high-quality medical care. According to various reports, around $60 billion is spent on college tuition per year—that’s a mere 10% of what goes to the military-industrial-complex. As of right now, colleges in the States could be tuition free, and the U.S. government would still have enough left over to be the top military-spender. Imagine how fast we would advance, and what we could accomplish in the future, if all Americans had access to a higher education. According to reports from 2013, the United Nations estimated it would cost $30 billion a year to end world hunger. 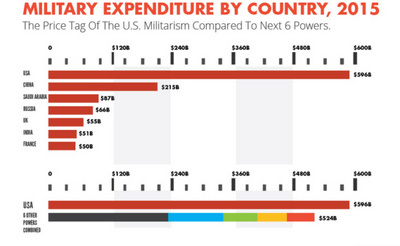 This is literally only 5% of what the U.S. spends a year on war. The United States could win the admiration of the entire world by improving the lives of humans everywhere, but instead the legacy we are leaving behind is one of death and destruction. So there it is; just a few of the many things our hard-earned tax dollars could be utilized for other than war. There’s going to come a day when citizens will have to decide if sacrificing our health and happiness is worth it all. Much of the US (and most other countries) military spending goes directly and indirectly to civilian employees of military contractors. In addition the expertise and military equipment are highly marketable to other countries (Congress/State Dept. tends to limit this market to politically acceptable customers. I agree we could do a much better job of taking care of our citizens but this can be done by improved policies and regulations at all levels of government (e.g., in terms of housing, local building and zoning codes are a major impediment to adequate housing (may not be consistent with the goals of the neighborhood). Similarly eliminating corruption at all levels of government would free a lot of resources for better use (this often prevents businesses, and jobs, from being established).